Whether you opt to wear a lehenga or a saree for your wedding, a bridal blouse is something one needs to purchase. While most of us focus on lehenga design, and saree design, not many of us delve too much into blouse design. But Chennai Bridal Blouse Designers are here to change that completely. Bridal blouse designs are somewhat a recent find for me too. These last few years, there have been amazing new bridal blouse designers emerging in every city. So today I thought, let me share not the usual Delhi, Mumbai designers, but Chennai Bridal Blouse Designers with you all. In case you are travelling from abroad for your wedding shopping, or are a native here in India, this list comprises of the best in the business. Mind you, I do not have price details yet for every brand. But as and when I come across some numbers, will update it in this blog post. The idea of this post is to share as many different bridal blouse designs there can be. Think of it as an inspiration board for your bridal wear. No matter what you choose to wear on your big day, you can go for any of these statement bridal blouse pieces to really shine on your wedding. There are some designers on this list who do love stories on the blouse, have stunning latkans, and a whole lot of quirky elements to catch your attention. So rather than rambling on and on, here are the list of the best Chennai Bridal Blouse Designers. I made this list of Chennai Bridal Blouse Designers more so for me than for you. 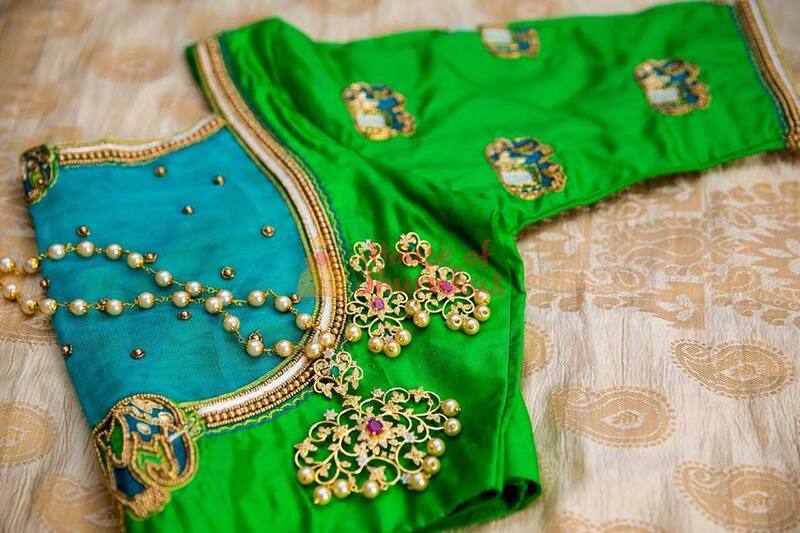 It’s the complete list of Chennai Bridal Blouse Designers on this blog post. There are so many good ones, I just had to share it all with you. Mind you, these are crazy expensive. Like really-really expensive. Gone are the days when blouses cost like 500-1000 bucks. These are legit high end bridal blouses we are talking about. So keep an open mind when you see some of the price tags on these blouses. That said, wearing one of these will truly be an experience of a lifetime. Some of these designers do extraordinary work in the form of concepts, designs, overall looks of their bridal blouses. They truly can command the price they are for their unique styles. What I love about this designer is that her bridal blouses are extremely wearable. The designs are not too over the top cray-cray if you know what I mean. They are sober, decent designs that a mother of the bride, bride, or even family members can opt for their outfits. You can choose to wear these designs typically with a silk saree or even with a lehenga. How many times has it happened with you – You visit your local tailor with your blouse piece. Open the blouse design book he shows you, and just go on and on turning pages without finding the right design? Has happened to me a million times. More so when I was shopping during my wedding, I remember I went bonkers because I had so many saree blouses to sort out. It drove me crazy to not be able to find unique styles. If you’re in the same dilemma, fret not girl. This post will give you way too many designs to bookmark. Ishithaa Boutique in particular has the most amazing range of look books for your bridal blouse. The general round about time is 15-25 working days depending upon the design you choose. Delivery can happen in a week or so but there will be additional express delivery charges for such orders. They also ship worldwide. Bonus: NRI brides can pre-book too by paying an advance (which is refundable in the order they place) to get priority. Sajna Bridal Wear is one destination where you can get sarees, designer blouses and lehengas for your big day. They are quite well known in Chennai. Usually you don’t see heavy bridal blouses with silk lehengas. If you are looking for traditional lehengas but with an edge to the design, then Sajna Bridal Wear can really give you a wide variety of options. If you are looking for stunning cut work design blouses, look no further. Yuti Designer Studio has some of the most exquisite cut work bridal blouses. Initially when I started writing this post, little did I know that Chennai Bridal Blouse Designers were so so talented. One really needs to see outside of Mumbai Delhi bridal markets to know what’s out there. I am so glad I am doing this blog post. I hope it does help some of you South Indian Brides especially to go out there and check out these amazing labels. So honestly, I haven’t been in touch with this label yet. But from their Facebook page, I found that the brand doesn’t just do bridal blouses. But they have anarkalis and festive wear as well. Real cutesy stuff. If you have a wedding in the family and want some not too over the top occasional wear, then this label is worth checking out. In the meantime, I will reach out to the brand and try and see if I can get more information to put here to ease your shopping experience. Got to love this one, right? This and the first blouse just took my breath away. I mean it’s not everyday that a bridal blouse is a showstopper piece. Love the whole butterfly wings effect it has while still looking every bit traditional. If loud is not your thing, and you’re looking for something subtle and elegant, then Paroksha is the brand for you. Their blouse designs are simple with beautiful embroidery detailing that can be worn by anyone. It’s not just about the bride, but you can get your mothers blouses, and even other family members wedding day blouses stitched from them. What I didn’t know while researching this brand was that they also do really pretty lehengas. Now I know that this blog post is strictly about Chennai Bridal Blouse Designers but I mean who minds looking through lehengas. I know I definitely don’t. If you are seeking fresh designs, never seen before on social media kinds, then Paroksha is a good place to stop by. How pretty is this gorgeous red lehenga. I am two minds whether it is bridal enough. Not sure, what do you think? Would you wear this on your big day?